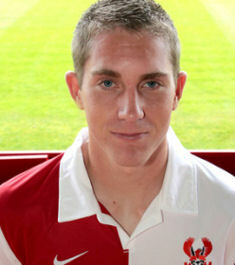 Zac Costello was given a professional contract by the harriers in August 2009 after spending the previous season in the Youth team. He had previously played for Nottingham Forest and Cambridge Utd as a youth. The tall Bromsgrove born defender was sent out on loan in November 2009 to local side Evesham Utd and eventually stayed with them for the remainder of the season after being released by us in March 2010 having never made an appearance.